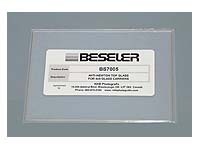 Replacement anti-Newton glass for Beseler #8343 4x5 glass negative carriers. Can also be used to replace the clear top glass in the #8342 4x5 glass carrier. Approximately 132mm x 98mm, with bevels on the short edges to properly fit in the retaining clips. Clear top and bottom glass are also available for these carriers.